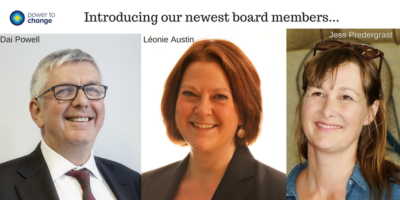 Léonie Austin, Dai Powell and Jessica Prendergrast have all joined the board of Power to Change, the independent trust supporting community businesses in England. The three appointments bring a wealth of expertise to the board at a time when cuts to public services are putting communities at ever-increasing pressure. Léonie Austin is Director of Marketing and Communications and a board member at NHS Blood and Transplant where she has led the development of behaviour change strategies working across a complex, national health environment with multiple stakeholders and targeting hard to reach groups. Dai Powell is Chief Executive of HCT Group, a large-scale, award-winning social enterprise in the transport industry, operating transport and training services from more than a dozen depots across London, Yorkshire, the northwest, the southwest and the Channel Islands. • Power to Change is an independent trust, whose funding is used to strengthen community businesses across England. At a time when many parts of the UK face cuts, neglect and social problems, we are helping local people come together to take control, and make sure their local areas survive and stay vibrant. • Community businesses are organisations rooted in a local area, run by and answerable to members of the community, and which make a trading profit to re-invest in doing more social good. There are already thousands of community businesses in the UK, doing everything from planning new affordable homes to reviving struggling local pubs. Last year, they grew 5 percent faster than both charities and small businesses.